"MIST": Press the "Mist" button, choose the time from 1 hour/3 hours/6 hours/steady on (up to 10 hours or until water is gone). Press the "Light" button again to change another color, 7 colors are available. 2. This is an essential oil diffuser, but you also can use it as a humidifier if you'd like. LARGE CAPACITY AND GREAT MIST OUTPUT This diffuser can hold up to 300 ml of water and produce up to 30 ml of moisture per hour. It can run up to 10 hours of continuous output. Automatically turns off when water is all used to ensure safety. MULTIPLE LIGHT OPTIONS Choose among 7 colors, between two modes: steady on or alternating colors. Each color is adjustable between bright and dim; or choose no light at all. Soft, LED light and a timed, automatic shut off makes this the perfect night light. 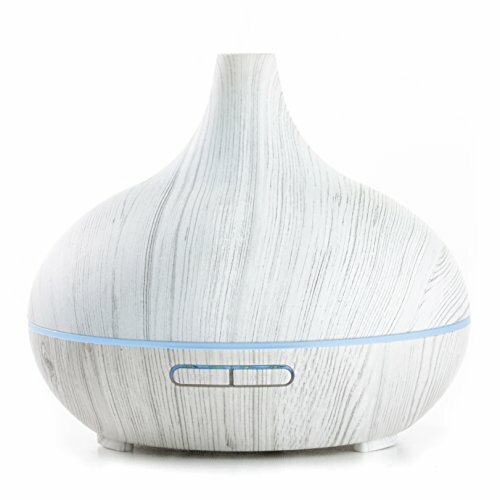 CLASSICALLY MODERN DESIGN This diffuser is coated with a white wood grain, giving it a natural and classic design that goes well with any decor. Compact and portable, you can use this humidifier anywhere. INSTANT RELAXATION Simply take off the easy-to-remove cap, add water and essential oil, and de-stress your life. Includes 4 time setting modes: 1, 3 or 6 hours, or up to 10 hours of steady on. Note: this is an essential oil diffuser, but you can also use it as a humidifier if you'd like. If you have any questions about this product by L E M O N, contact us by completing and submitting the form below. If you are looking for a specif part number, please include it with your message.